Everything is bigger at the gas station: from the soft drinks (damn you, Bloomberg) to soft pretzels. 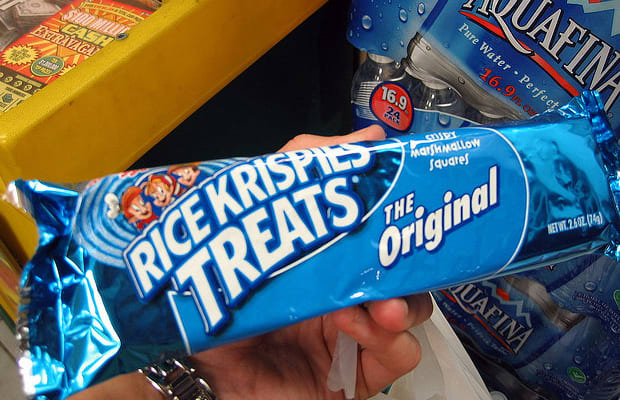 One of our favorite all-too-large snacks has to be those foot-long Rice Krispies Treats. You were first introduced to the kid-friendly snack in sensibly-sized portions, cut from your mother's baking pan. Now that you are an adult, old enough to drive and waste your money on novelty-sized snacks, you should have the right to enjoy a treat four times the suggested serving size. Why? Because this is America, damn it.